Vesio is located at the foot of the glacial moraine bordering the Bondo valley, 618 meters above sea level. It is the northernmost village in the municipality of Tremosine sul Garda. Vesio is 2.6 kilometers from the town of Tremosine sul Garda and it is the most populated village according to the last census. The village name probably has Latin origins. Vesio was ruled by the Venetians between 1426 and 1797 - a mirror factory, numerous mills and several iron workshops in the Brasa valley date back to this period. 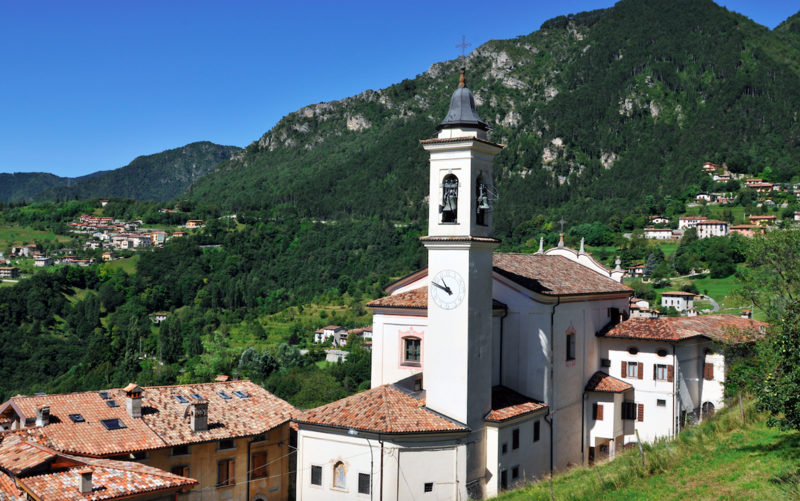 In 1750, after 170 years of discussions and struggles, the parish of Vesio separated from Pieve’s, to which it had been linked up to that moment. Most of the town's historic buildings date back to the 18th and 19th centuries. During the First World War the whole territory of Tremosine sul Garda was intensely fortified by Italian soldiers, starting from 1917 onwards when the front line in the Ledro valley was held. Vesio was a military garrison, and it became the seat of one of the directorates of the Military Engineering Corps in the 15th Area. It was the Military Engineers who built the Tremosine sul Garda mountain and valley roads for military purposes, as well as the provincial road 38 connecting Tignale to Limone, the high-altitude road to the Nota pass and that one across the Bondo lake bed. The Church of San Bartolomeo is Vesio’s parish church, dating back to the second half of the 18th century. It was built on the site of a chapel of which there is no trace left. In via Bettino, the road that links the parish church to the provincial road, there is a wayside shrine dedicated to the Crucifixion, while in via Giacomo Zanini it’s possible to see another shrine dedicated to the Sacred Heart. In Via Simosegna you can find a fresco depicting the Madonna with Child and Saints. In Vesio there is also the Cassa Rurale e Artigiana, founded by don Giacomo Zanini in 1896. Vesio’s patron saint day is August 24, while the week after Easter in the village are celebrated the Sacre Quarantore (Forty Holy Hours), in honor of the Sacred Heart - a painted wooden scene surrounded by candles is placed on the main altar of the Church of San Bartolomeo, where it remains for a period of forty hours.